GreenSpark founders Ella Malamud and Alex Chernomazov stand at the future site of GreenSpark's renewable energy exhibits. In the background are three modified shipping containers housing the park's transportation exhibits. "There are many places in the states where you can come and see one individual technology built 25 different ways," says Alex Chernomazov. "But in our journeys and in all of my research, I could not find a single place in the states where you would see all the different sustainability technologies brought under one umbrella." Chernomazov is talking about the void he and his wife Ella Malamud intend to fill with GreenSpark. It’s a private park in Waterbury Center dedicated to sustainable living. The exhibits are still going up and they’re planning a grand opening in the spring. But this fall they’re inviting visitors in to see what the park has to offer so far. Adults pay $12 and kids are free. "It’s a green 'spark' – with the ‘S’ representing sustainability, park," Malamud explains. "And it’s a spark of inspiration, we’re hoping, for people who visit." Chernomazov and Malamud’s inspiration came from a trip around the country. But first their story started far away from Vermont. 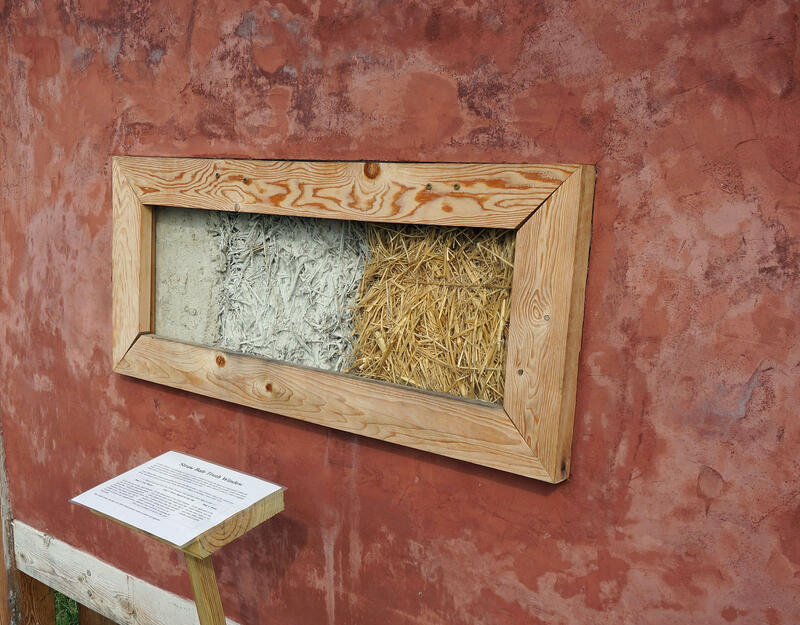 This truth window shows the process of building with straw and clay. It's one of the park's green building exhibits. The couple were both born in the former Soviet Union and emigrated to New York City with their families from the same city in Ukraine. But they didn’t meet until many years later, on a trip to Arizona. When they returned to New York they started building a life together. But soon, Malamud says they began questioning what kind of future the city had to offer. "We were basically … leading normal young professional lives in New York City and planning to get a house in the suburbs and raise a family when we realized that, so this is going to be our life for the next 25 years? And how is this going to impact the world? And how is this going to impact us and our kids?" Malamud says. So before settling down with a house and kids, they did something sort of drastic. They quit their city life and hit the road. Alex Chernomazov sits in GreenSpark's ELF. 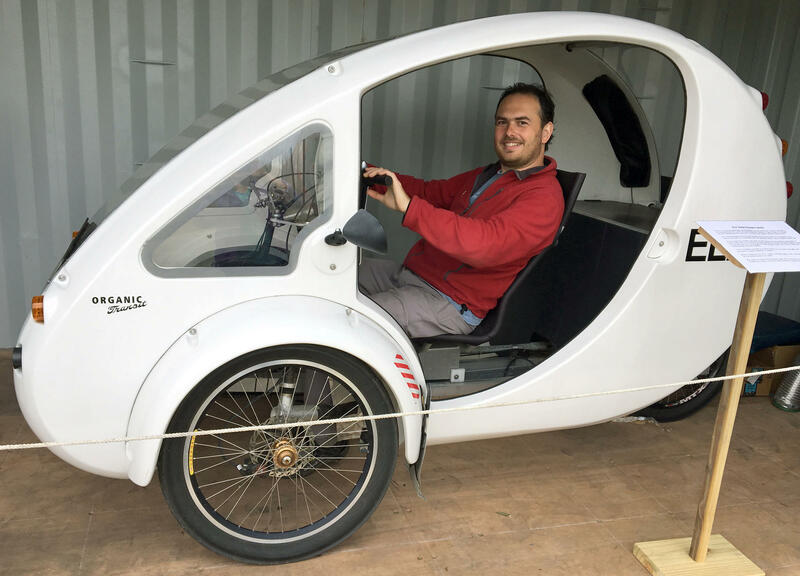 It's a hybrid vehicle that operates with solar-assisted pedal power. "We moved into our car and went across the country," says Chernomazov. "We zigzagged coast-to-coast, up to Alaska and down to Florida. And it started out as us just trying to see what is it that people do to live sustainably. And just to see what else is out there." And it turns out there was a lot to see. They discovered houses made of straw bales and cordwood. They visited an Earthship, made of used tires, where water is recaptured and reused several times over. "So many people were asking us, ‘Oh, but that’s future technology. We have to wait until it’s actually accessible. We have to wait until it becomes cheap. We have to see if it’s actually going to make sense. Does it actually save you, the planet, the earth?’"
Chernomazov jumps in with, "'Are there actually people doing that?'" "And it turns out," Malamud continues, "outside of very urban bubbles, it does." 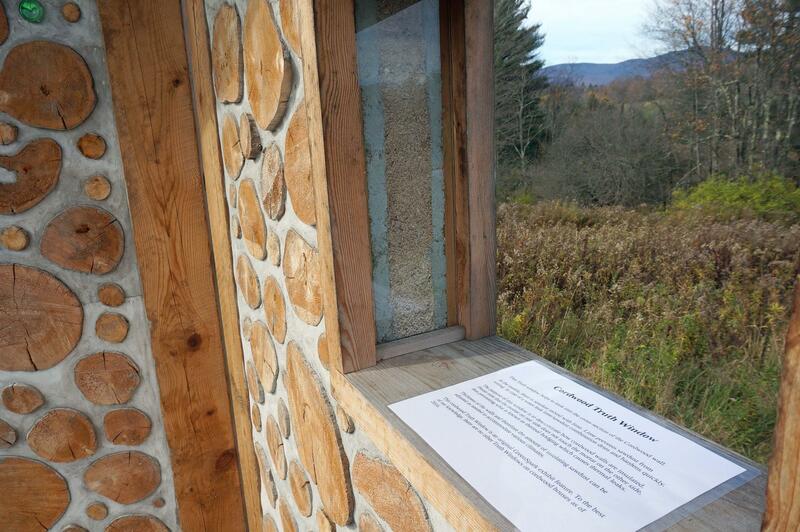 This exhibit shows cordwood buildings are made from wood and mortar, and insulated with sawdust. So Chernomazov and Malamud decided they had to share what they learned. They settled on Vermont because it’s not too far away from that New York City "bubble" where their families still reside. And Malamud said they found many like-minded people here. The park’s welcome center and its transportation exhibits are housed in modified shipping containers. Doors are cut out of the long sides of the containers, so they're bright and airy spaces when open, but safely secured when the doors are closed and locked. The welcome center is powered by solar panels on the roof. And the inner workings of the solar electricity process are on full display for visitors to examine. The Whike is a wind-assisted tricycle made in the Netherlands. In the background is a 1988 ComutaCar, an early mass-produced electric car. At its sustainable garage, GreenSpark showcases vehicles with various types of propulsion. "We have electric, we have wind, we have biomass," Chernomazov says. 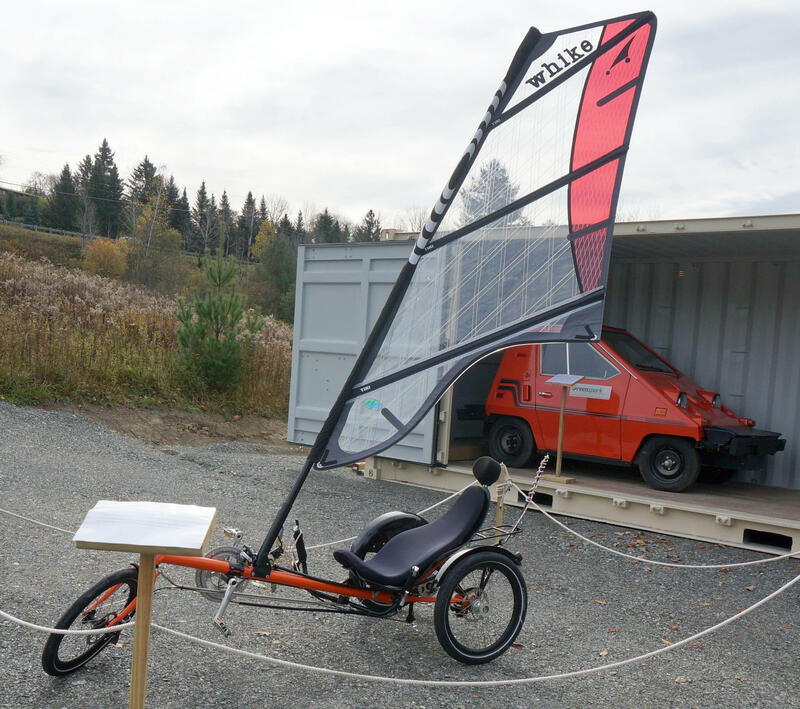 "Our first exhibit is a wind-driven trike that comes to us from [the] Netherlands." Malamud assures me the brakes work quite well. Other areas of the park showcase many of the sustainable energy and green building techniques the couple gleaned from that trip around the country. And now that they've landed here in Waterbury Center, they're ready to start sharing what they've learned. In the heart of Plainfield there’s a utility pole covered with messages of love. But not everyone in town is moved by the mysterious “love” signs. In approving stricter sound limits for ridgeline wind turbines Thursday afternoon, the Legislative Committee on Administrative Rules has managed to upset both sides on the wind energy debate. Green Mountain Power wants to build Vermont's second commercial renewable energy storage battery near its solar array in Panton.